Our pies and pasties are made and baked fresh each day in the North Street ‘bakehouse’. From the opening of the flour bag in the early hours to the packing in boxes mid morning we take pride in the knowledge that our pies and pastys are created with care and attention by our team of workers. Each product is made from quality ingredients sourced locally wherever possible. We appreciate that our customers are loyal to us and we in turn are loyal to our local suppliers. Over the years we have had many tales from ‘locals’ who have travelled the world and have yearned to return to Bristol for a Clark’s Pie, especially soldiers returning from war with Germany in the 40’s, the Korean war and even more recent conflicts. We’d like to think we helped our lads get the job done just to enable a speedy return back to our pies. And not forgetting the lasses… One mother got in touch with the Bristol Evening Post a few years ago and recounted a story of when she was pregnant and the craving for Clark’s Pies during her pregnancy. The traditional Clark’s Pie is famous for its pastry, which is thick enough to eat without a foil tray. Made with the same ingredients as it was first made over a hundred years ago : beef, ox kidneys, potatoes, onions and our special gravy. Our original pies and pastys are so popular with our customers that we haven’t needed to make many changes to our product range over the years. The exception is ‘the newbie’ in the bakehouse, which is still a wee undiscovered gem. Made using ‘Red Ale’ sourced direct from the Bristol Beer Factory just around the corner from the bakehouse in North Street. We cook diced skirt steak in the ale along with mushrooms and onions and encase it with a shortcrust base and a flaky pastry lid. Perfect companion for a pint. The filling is traditional and wholesome, beef, potatoes and carrots. Nothing fancy or complicated. Otherwise known as the Clark’s Pasty. Made in either a Shortcrust or a Flaky pastry. These pastys use the same filling but produce different flavours in the mouth depending on which pastry you opt for. Both pastys are hand made by our delightful staff in the first floor pasty room, each person having their own way of crimping the shortcrust. One retired lady, Vivien had the neatest crimp on a shortcrust pasty we have ever seen. No-one has yet to replicate her fast neat skills with pastry. Grated mature cheddar cheese, mixed with fresh boiled diced onions and mashed potato, all wrapped up in a flaky pastry. Pork & Beef sausagemeat in a flaky pastry. Our team of 16 men and women sing (how can I stop them? ), dance and chuckle their way through baking the 2000 pies and pasties each day. I like to think that it is more of a social get together! We also have 4 drivers responsible for making sure the pies are delivered on time. If you are interested in joining our team, please do get in touch. We currently do not have any vacancies, but will get in touch should an opportunity become available. 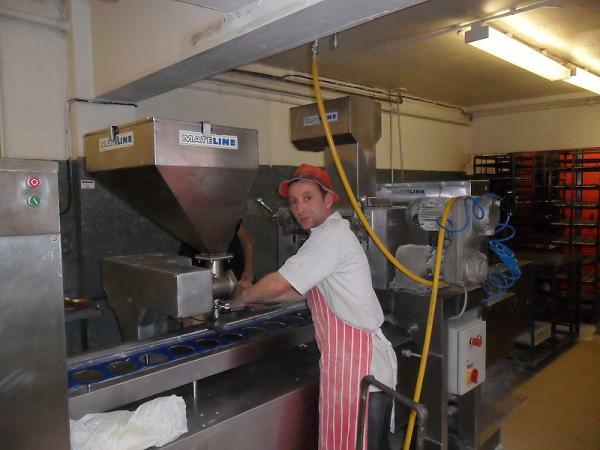 If you are interested in joining the Clark’s Pies team, please contact Keith on 0117 9663894 for an application form. We will get in touch should a vacancy become available. The story of Clark’s Pies starts a hundred years ago in Cardiff, where Mary Clark, the mother of nine children, worked as a housekeeper for a wealthy family. One day, whilst making the weekly steak and kidney pie for the family, she broke the big dish she used and had to make individual pies instead. They tasted so good her friends and family suggested she should sell a few. So with Percy, Mary’s son they started to make pies to sell to passers-by. Times were very hard, so it came as a very welcome supplement to the Clarks income. Clark’s Pies was established in the form of a table on the pavement outside her terrace house and soon after, the first shop opened. The pies are still sold in Cardiff today. In 1929, Mary's son Percy decided to branch out to Bristol, establishing a shop in Old Market, Bristol and continued to make pies using his mother's secret recipe. Six years later he moved to a new premises, 259 North Street, Bedminster, where he was better located to feed the hundreds of women and girls working at the Wills cigarette factory (now the Tobacco Factory). Stories of queues leading from the Bakehouse all the way down North Street to Raleigh Road are retold by many elderly customers in the shop. Percy lived over the shop with his wife and four children. Despite his ambition to be an astronomer, Percy's son, John, started working for the business aged 15 and stayed for the next 42 years. The business was eventually passed to John and then on to his younger brothers, Ken and then Roger Clark. Almost 80 years since the move to the Bakehouse in North Street, Clark’s Pies is still thriving in the original North Street premises and is now run by the fourth generation of the Clark’s family in the business. Roger's daughter, Dawn Clark and her partner Keith Prested both retired as professional ballet dancers with Scottish Ballet and moved back to Bristol in 2001. Both took over the running of the business in 2008 just in time for the recessions…..but they survived and are looking forward to taking the business on to the next part of its journey. The business continues to deliver daily to about 200 outlets, details of which can be found on our Where to buy [hyperlink] page. Whether you’re interested in selling our pies, have a query, or would like to give us some feedback, please use the contact form below, or call us on 0117 966 3894. For details of our shops, please see the Where to buy page of this site.